Sarah Palin Tells Karl Rove Where To Go... : It's All Politics Sarah Palin appeared to take a playful shot at Karl Rove in her Iowa speech, telling him where to go. 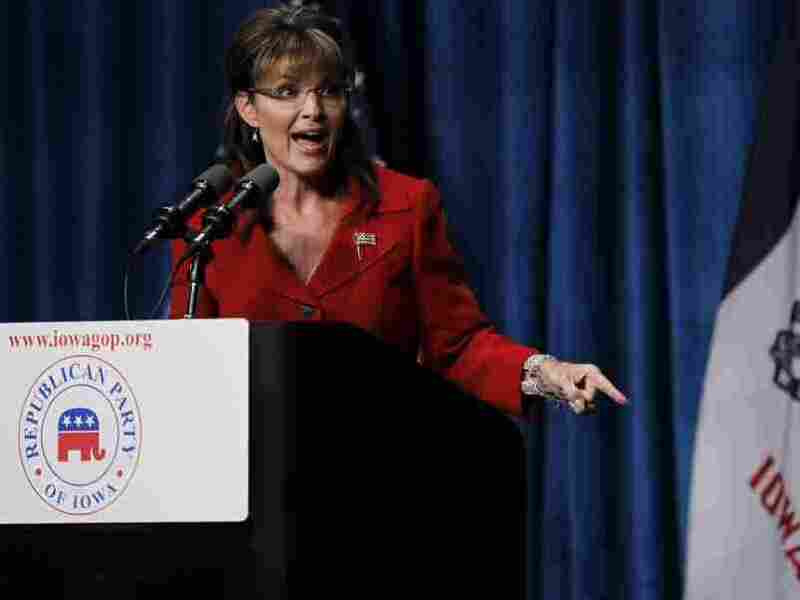 Palin and Rove have sparred over the Tea Party movement with Palin backing a candidate in Delaware Rove has publicly raised doubts about. Maybe we need instant replay for political speeches. That might make it easier to see, in Sarah Palin's much anticipated Iowa speech Friday evening, the former Republican vice presidential nominee playfully telling Karl Rove where to go, if you catch my drift, without actually saying it. The moment in question came during the part of the speech where Palin was saying how she would dole out assignments if she were the running the Republican Party, like a football coach runs a team, in the weeks leading up to the November election. She would tell Sen. Jim DeMint of South Carolina, a major player in Tea Party movement as she is, "You're awesome. We need you down south." She'd tell Mitt Romney to go campaigning in the West, George W. Bush to raise money and Rush Limbaugh to "go deep, go anywhere, everywhere, people are listening." And Karl, Karl, go to (she pauses ever so slightly and her demeanor stiffens subtly) here. You can come to Iowa. And Karl Rove and the other leaders who will see the light and realize that these are just the normal hard-working patriotic Americans who are saying no, enough is enough. We want to turn this around and we want to get back to those time-tested truths that are right for America." So not only does she appear to playfully taunt Rove with the "go to, here" line, she implied that he was in the dark about what's really happening in the Republican Party. For if he weren't in the dark, why would he need to visit Iowa to "see the light?" The moment has that all important plausible deniability. Palin can say she didn't tell Rove to go to hell and she didn't. The moment also contradicted Palin's message at the fundraising dinner held in the memory of former President Ronald Reagan, that the Republican Party needed to unify for the November election. But she clearly had a bone to pick with the party's "leaders" or "hierarchy" especially Rove. In the past week, Rove has very publicly bashed Christine O'Donnell who won the GOP Senate nomination in Delaware after Palin endorsed her. Rove repeatedly raised troubling questions on Fox News about O'Donnell's honesty and financial problems even as Palin basked in O'Donnell's win over the more moderate Republican Rep. Mike Castle. Rove is all about winning general elections and has the results to prove it. Meanwhile, while those in the Tea Party movement apparently like winning as much as anyone else, many in the movement clearly put less of a premium on the practical political considerations that often lead to general election wins than Rove does. Like picking candidates who can appeal not just to the conservatives but independents and enough Democrats to win elections, which is the point some in the Republican establishment are making. Palin's message at Friday night's Iowa fundraising dinner likely isn't going to leave the party any more unified than it was before her speech. The fight for the future of the party continues. And it will involve Republicans violating what the man the fundraising dinner was named for -- President Ronald Reagan -- called the 11th commandment. Thou shalt not speak ill of any fellow Republican.